Caroline Rousset, ca. 1851. Courtesy of the New York Public Library Digital Collections. The task of understanding the meaning of the words and phrases that constitute legal texts has always been an important one, but the urgency is even greater today. The Constitution includes the following phrases, all controversial but none self-evident: “keep and bear arms”; “the recess”; “cruel and unusual punishment”; and “gifts, emoluments, offices or titles.” The leading modes of constitutional interpretation — originalism, textualism, and common-law constitutionalism — rely on distinct theories of meaning, but they do not agree on which meanings are relevant or even on what “meaning” means. With my colleague Jason Merchant of the University of Chicago’s linguistics department, I have been working for the past three years on a project that brings together the fields of law and linguistics, as well as my other field, intellectual history. Our project, titled “Historical Semantics and Legal Interpretation,” brings together research in historical jurisprudence and in theoretical and computational linguistics in order to understand the meanings of words and phrases in context. Recent advances in theoretical and computational linguistics, as well as vast new corpora of American and English usage, make possible the precise identification of the lexical shifts that have occurred over the past two centuries. This perennial question of what words and phrases mean is particularly important in the arena of constitutional interpretation. Which written sources, and which words, count for purposes of determining constitutional meaning? This question is being asked across the spectrum of constitutional interpretation, in theories ranging from originalism to common-law or “living” constitutionalism. Originalism is associated with the late justice Antonin Scalia, as well as several current members of the Court, including Chief Justice John Roberts and Associate Justice Neil Gorsuch, and a number of prominent legal scholars. More adaptive views have been embraced by Associate Justices Ruth Bader Ginsburg and Stephen Breyer, as well as constitutional law scholars including my colleague David Strauss. Each of these approaches requires the interpreter to articulate which sources and which words count. The emergence and tenacity of originalist theories are part of a larger jurisprudential trend toward grounding legal authority in disciplines outside the law. The search for authority is laudable, insofar as it acknowledges that “law” is not only a particular domain with its own norms and language but also a field of contestation that is acted upon by a variety of social forces, including politics and economics. But when originalist judges reach outside the domain of law, they tend to gravitate toward some fields—and some versions of those fields—more than others. Much of originalism’s appeal lies in its reliance on a specific type of historical authority, and in the fact that it portrays historical meaning as an objective fact capable of being ascertained by a non-specialist reader. According to originalism’s “fixed-meaning canon” as articulated by Justice Scalia and Bryan A. Garner, “Words must be given the meaning they had when the text was adopted.” The words of the Constitution are, for the most part, recognizable to a modern speaker of English. The canon therefore rests on two premises: first, that there was a single meaning of the words at the time the text was adopted (for the Second Amendment, 1791); second, that this meaning is accessible to modern readers. Originalism’s version of a historical approach stands in stark contrast to the rigorous empirical research that Chief Justice Roberts dismissed as “sociological gobbledygook” in last term’s partisan gerrymandering case, Gill v. Whitford. Any informed modern speaker of English can read an old text and determine what it means, the theory implies. Moreover, the theory relies on a tool that most historians, as well as linguists, treat with caution: the dictionary. In particular, the justices tend to reach for Samuel Johnson’s Dictionary of the English Language, first published in 1755. The Court’s recent decisions on the Second Amendment illustrate some potential problems with the non-specialist view of history. In District of Columbia v. Heller, decided in 2008, the Court addressed the constitutionality of a DC law regulating gun ownership. In a five-to-four decision, with Justice Scalia writing for the majority, the Court held that the Second Amendment protects an individual right to possess a firearm, unconnected with service in a militia. But our research demonstrates that the language of the Second Amendment points toward a more collective interpretation of the right of gun ownership than Justice Scalia’s opinion acknowledges. The prefatory clause’s reference to a “well regulated Militia” then becomes more meaningful than the Court suggested in Heller. 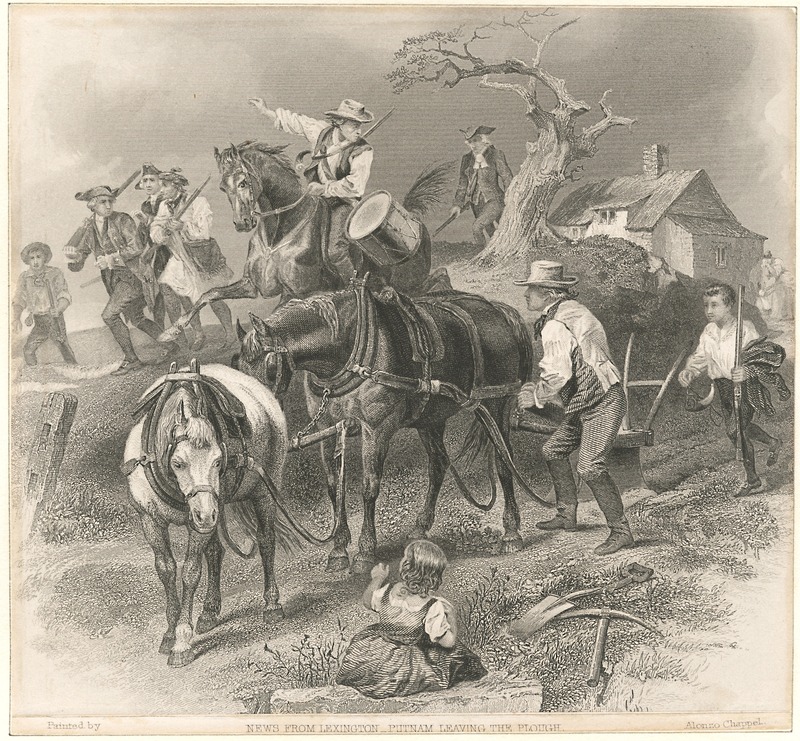 News from Lexington—Putnam leaving the plough. 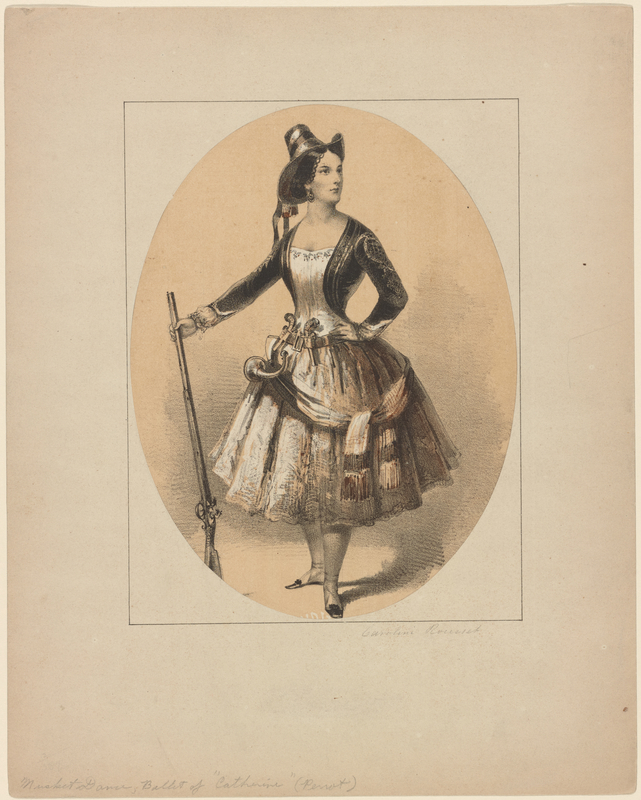 Courtesy of the New York Public Library Digital Collections. Using the Google Books corpus, we searched a range of published materials dating from the period between 1760 and 1795 for the phrase “bear arms.” We then classified by hand each of the 181 texts that our search produced according to the following categories: the use or sense in which the phrase “bear arms” was employed (collective, individual, or undeterminable), and the type of subject that accompanied the phrase (plural, singular, or undeterminable). A last category was for heraldic uses. Our preliminary results are striking: In 64.09 percent of the instances in which “bear arms” was used, the phrase was used in a collective sense with a plural subject (e.g., “Slaves were not permitted to bear arms.”). In 18.23 percent of the instances, the phrase was used in an individual sense with a singular subject (e.g., “I’ll fire his blood by telling what I did/When I was strong, and able to bear arms.”). Collective singular uses accounted for 3.31 percent of the instances (e.g., “when a slave was made free, a spear was put into his hand, and he was thenceforward permitted to bear arms, and subjected to military services.”). The remaining instances were undeterminable but plural (5.52 percent), undeterminable altogether (4.42 percent), or heraldic (4.42 percent). According to our research, then, in 67.4 percent of the instances in which the phrase “bear arms” was used in books published between 1760 and 1795, the phrase was being employed in a collective sense. (The results for newspapers are even more dramatic.) For most ordinary citizens in the founding generation, then, the phrase “bear arms” referred to an activity undertaken by groups of people, not only by individuals. In other words, consulting actual historical sources suggests that the context of the Second Amendment had more to do with militias and magazines than with solo householders molding bullets over their hearths. This finding challenges Justice Scalia’s assertion that the only plausible interpretation of the Second Amendment, according to his own “normal and ordinary” meaning test, is that it protects an individual right to possess a firearm unconnected with militia service. Transcript of Oral Argument at 40, Gill v.Whitford, No. 16-1161 (2018). District of Columbia v.Heller,554 U.S. 570, 576, 577 (2008). Id. at 578 n.4, 599. Quentin Skinner, “Meaning and Understanding in the History of Ideas,” History and Theory8, no. 1 (1969), 36‒37. Alison L. LaCroix is Robert Newton Reid Professor of Law and Associate Member of the Department of History at the University of Chicago. In a recent speech and Op-Ed, former U.S.Supreme Court Justice John Paul Stevens urged people to support a constitutional amendment to eliminate the 2d amendment so effective gun control laws may be passed. But there is no need for this, which entails a lengthy, expensive, and convoluted process, and ushers in the danger that other subjects may get included. Constitutional amendments are only for cases of dire need. This is not one. The Court majority was wrong in D.C. v Heller, on its own premises, and the next court case can correct the error. The Heller majority consisted of Justices who, in the main, believe in following the language of the Constitution and the history of that language. The minority wants a different, “modern” more flexible approach. But one does not need to enter into the debate as to which approach is preferable to understand where the majority in Heller went wrong — on its own terms. That is, they got the history and language wrong. They traversed a lot of history, but missed the most relevant and powerful. Once you see it, the result is foreordained. Here’s a brief look-see at why. Thus the language of the 2d amendment includes the key phrase “well-regulated” militia. This contrasted with, what was common at the time, “ill-regulated” militias. “Well-regulated” necessarily implies training, discipline, proper arms, organization. This an individual or private party cannot provide, only the state. An “ill-regulated” militia is people who show up with their own guns and ammunition, but lack the training and discipline needed to confront an enemy in battle without running at the first sound of cannon or weaponry. So the language on the face of it drives the conclusion that the 2d amendment is principally concerned with ensuring a “well-regulated militia”, and that the “right of the people to keep and bear arms” is part of that because an individual right to arms untethered from discipline and training does not support this goal but undermines it. “Ill-regulated” militias destroy the very protections sought to be ensured. To read “the right of the people to keep and bear arms” detached from the rest of the language so it creates an “individual right to guns” manufactures a purpose contrary to that expressed in the 2d Amendment’s plain language. It turns “well-regulated” into its opposite. John Marshall, The Life of George Washington, vol II, p. 28 (Rev. Ed)(Citizens Guild, 1926), (Chief Justice Marshall was given all his papers and authorized to write his biography)(originally published 1804-07). Earlier that same year, in March, 1776, a remarkable work was published, which became not only the first economic text, but an extraordinary analysis of military history as well. In Wealth of Nations, Adam Smith explicitly defined what it meant for an armed force to be “well regulated”. To protect itself a civilized society must evolve away from a militia of untrained farmers to a “well regulated” one — using the very phrase which Congress was to adopt in the Articles of Confederation (1781) and the 2d Amendment (1789). By “well regulated” he described, as Washington did, a force with “the habits of regularity, order, and prompt obedience to command”, “well-disciplined and well-exercised”. These are qualities a militia dependent on individual resources cannot sustain. Smith observed, as Washington experienced, that a militia which is not well regulated will invariably break at the first onset of “the noise of fire-arms, the smoke, and the invisible death to which every man feels himself every moment exposed, as soon as he comes within cannon-shot”. Adam Smith, Wealth of Nations, Vol. 2, Book V, Ch. 1, Part 1 (University of Chicago Press ed. 1976). John Marshall, Life of George Washington, Vol. II, at 201-202. These observations on (what later came to be known as) the problems of “incentives”, “free riders”, and “the logic of collective action” are such as might award Washington a Nobel prize for economics in the late 20th Century. There is not much room to argue that an individual right was contemplated under the Articles of Confederation. It is doubtful the redrafting into the Second Amendment (1789) was intended to change this understanding. Nothing in the historical record suggests this was the case. Nor was such a right common among the states during that period; indeed, those states that did not expressly provide arms and training but relied on individual resources stated it was an obligation, not a right, of individual militiamen to provide arms and a box of ammunition (See, e.g., Mass, N.Y., Va., discussed in U.S. v. Miller). Poverty could be an excuse (see, e.g., Va), so these provisions operated as sort of a tax in kind, quite the opposite of an individual right. The reservation to “the States” of power to appoint officers and implement training underlines that at the time of the Constitution the militia was conceived as a creature of the state, state-controlled, and state-regulated, not as the creature of individual right. The progression from the Articles of Confederation (1781) to the Constitution (1787) to the Second Amendment (1789) strongly suggests that the Second Amendment was intended to ensure that the power to control their militias which the States had enjoyed under the Articles of Confederation was not somehow by implication subverted in the process of drafting the new Constitution. The Constitution did eliminate the explicit mandate that States have militias and gave a new grant of power to the federal authority to provide for “organizing, arming, and disciplining” them. Thus if a State wished to end its militia or grant its citizens an individual right to arms, that was its business. The business of the Second Amendment, however, was to ensure that no one interpreted the new Constitution so that the States lost all control over their militias to the federal government. Implying an individual right to arms creates impossible quandaries and logical paradoxes. A simple logical exercise reveals the hurdles the text presents to the view that the 2d Amendment reflects an individual right to possess guns. A commonplace rule of construction requires all portions of an enactment to be given meaning. What then, if a State decides its militia (or in modern parlance, its “guard”) is no longer useful and abolishes it? This is in fact close to the case. If — as the majority in D.C. vs Heller concluded — an individual right was created, then each of us has a right to guns independent of the existence or not of a state militia, for it’s not much of an individual right if the State can so readily eliminate it. But, if it’s an individual right, then the first part of the Amendment, which purports to set out its purpose, becomes meaningless; a militia is completely unnecessary to whatever the 2d Amendment provides. Everybody has a right to guns regardless of the existence of a militia. As readily appears, the individual right theory creates either textual meaninglessness or absurdity. The alternative sometimes suggested (indeed inferred from the Supreme Court’s cryptic 1939 decision in United States v. Miller, its lone ruling on the topic) — that an individual right to guns might exist so long as the guns have “some reasonable relationship to” the needs of a militia (307 U.S. at 178) — provides a judicially unworkable standard in the absence of any constitutional guidance as to what a militia does or might need. To leave that question up to government creates a circularity. Can the state create a militia consisting only of archers or pilots and thereby eliminate all rifles and pistols? The courts would be utterly at sea trying to settle on such matters. Courts finding an individual right fell into that trap because of a false parallelism between the language “the right of the people” which appears in the 1st, 2d and 4th amendments. The 1st and 4th of course, have been held to contain individual rights. Therefore, the reasoning goes, doesn’t the 2d also have to? Not if the phrase “the right of the people” is ambiguous, which it plainly is. That is, it could suggest an individual right, or a collective one. It looks both ways, indeed more strongly towards a collective than an individual right. Given this ambiguity, the facial parallelism is destroyed and one must look to context and history. As the Court said in its only previous 2d Amendment case, U.S. vs Miller, the parallelism is “suggestive”, “but by no means conclusive.” It is the beginning of analysis, not the end. Most important, one must consider ALL the language of the Amendment, not rest satisfied simply on some limited phrase or word. The Heller majority, by failing to recognize the significance of the “well-regulated” introduction, lost the meaning of the 2d Amendment and went astray on its own premises — attention to all the language and their plain meaning. If the 2d Amendment provides not an individual right but a collective power of defense by the people of a State, these false detours, dilemmas and logical traps vanish. The words and phrases of the 2d Amendment harmonize. The most persuasive and powerful history is brought to bear. The usual legal Canons of Construction are satisfied. ALL the words of the amendment are given their plain meaning. So why stretch to find a chimerical individual right? The author is a 1962 graduate of Harvard College and 1965 from the University of Chicago Law School, where he was Managing Editor of the Law Review. He was an Assistant U.S. Attorney and consultant to the Office of Criminal Justice in the Department of Justice. He is a member of the bars of Illinois, D.C. and Massachusetts, practiced law (retired), and served as Chairman of the Committee on Character and Fitness for the Supreme Court of Illinois. He has argued three constitutional cases before the United States Supreme Court, is a life member of the American Law Institute, Who’s Who in America (1979-), and is the author of various articles on the Constitution. Coxe did not read “bear arms” as any sort of idiom and plainly did not see the right to keep and bear arms as a collective right. Moreover his linking of the private ownership of arms with the security of a free state is manifest. The author of the OP can count and parse and try to explain away what was meant, but there it is. And if we dared to read the earliest state court decisions (despite Justice Stevens’ hand waving) regarding the right to bear arms under the various state constitutions again we would find that the right was an individual right in nearly every case, though some courts such as Aymette saw the right of the citizens to keep arms as limited to the common defense. The dispute early on was between those who read the right to keep and bear arms as a broad individual right for defense of self as well as defense of state (Bliss vs KY, Nunn vs GA, etc) and those courts who read it as a limited individual right to keep and bear arms but only for the defense of the laws and of the state such as Aymette vs TN and AR vs Buzzard. The purely collective view was taken up by only one judge in Buzzard and did not carry a majority until cases in the 1900s. or that persons who were slaves could not carry weapons?